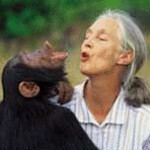 We champion the mission and objectives of the Jane Goodall Institute. We generate donations for JGI by clicking in Care2's "Race for the Primates". We celebrate and study primates and work to improve their lives in captivity and in the wild.